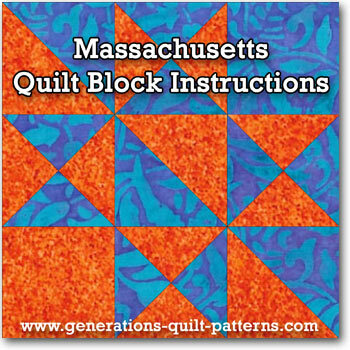 The Massachusetts quilt block is a variation of the Ohio Star block. Using an imaginary line from the upper left to the lower right corners, each side of the block is a mirror image of the other. For a successful block, use high contrast fabrics. 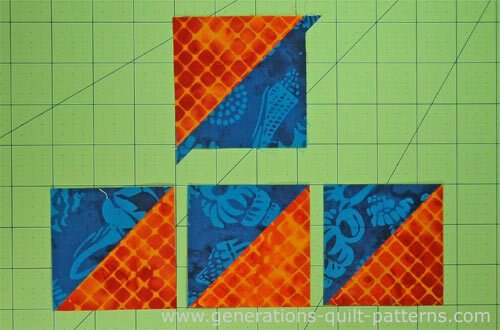 For the sample block I'll use the complementary colors of blue and orange for drama. The pieces of the Massachusetts block are very basic, but it does get a bit confusing when you're ready to stitch the block together. Quite frankly it looks like a mess until all the seams are sewn. But we won't let that stop us. Let's get to the quilting! SA are 1/4" and pressed toward the darker fabric unless noted otherwise. When you are instructed to press, first press the pieced unit flat to set the seam. Then open the patch, pressing from the front. Patches are cut based on the Quick Pieced method for HST and the Sandwich technique for QST. 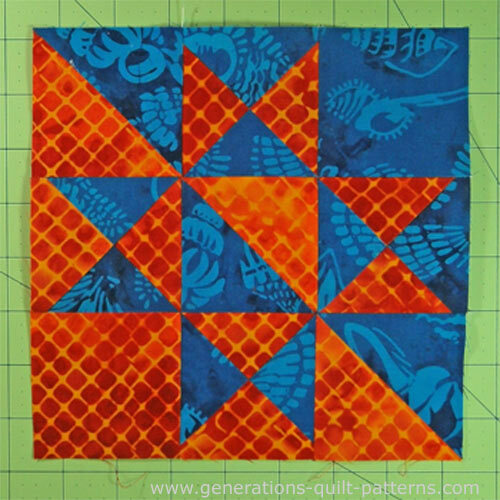 I prefer to use over-sized squares for both QSTs and HSTs, stitch the unit and then trim to the perfect size. QST patches are marked with ***, HST patches are marked with **. There is another chart later in the instructions that provides the size to trim these units. 1**	 L	 2	 2⅜"	x	2⅜"	 2⅞"	x	2⅞"	 3⅜"	x	3⅜"	 3⅞"	x	3⅞"	 4⅞"	x	4⅞"
2**	 D	 2	 2⅜"	x	2⅜"	 2⅞"	x	2⅞"	 3⅜"	x	3⅜"	 3⅞"	x	3⅞"	 4⅞"	x	4⅞"
3***	 L	 2	 2¾"	x	2¾"	 3¼"	x	3¼"	 3¾"	x	3¾"	 4¼"	x	4¼"	 5¼"	x	5¼"
4***	 D	 2	 2¾"	x	2¾"	 3¼"	x	3¼"	 3¾"	x	3¾"	 4¼"	x	4¼"	 5¼"	x	5¼"
5	 L	 1	 2"	x	2"	 2½"	x	2½"	 3"	x	3"	 3½"	x	3½"	 4½"	x	4½"
6	 D	 1	 2"	x	2"	 2½"	x	2½"	 3"	x	3"	 3½"	x	3½"	 4½"	x	4½"
Grid Size	 1½"	 2"	 2½"	 3"	 4"
I prefer to use over-sized squares for both quarter and half square triangles, stitch the unit and then trim to the perfect size. QST patches are marked with ***, HST patches are marked with **. These are the cut patches. 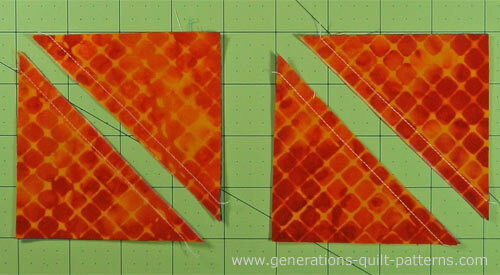 Draw a diagonal line on the back of all four light (orange) squares. With RST, layer a light and a dark 3-3/8" square and stitch 1/4" from both sides of your drawn line. Press with the seam allowances toward the darker fabric. Use the chart below to check the accuracy of your sewing. 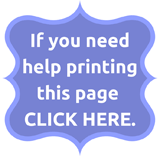 Trim your HST to size as needed. The finished HST—the Massachusetts uses just three of them so one is left untrimmed. 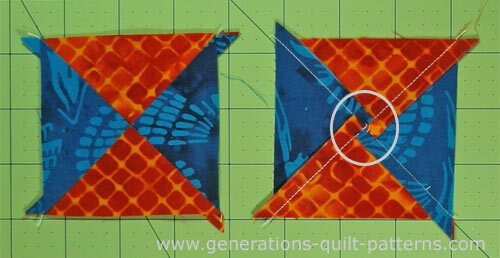 For more detailed information on this Quick Piecing technique click here. With RST, layer a light and a dark 3-3/4" square and stitch 1/4" from both sides of the drawn line. 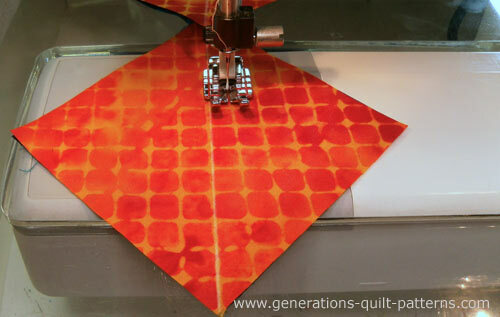 Cut each unit apart on the drawn line and press, with seam allowances towards the dark fabric. Voila! You've just made four half-square triangle units...the first step! On two of these HSTs, draw a diagonal line that bisects the seam allowance. With RST, layer a marked and an unmarked unit and, again, stitch 1/4" from both sides of the line. helps to keep the seams matched when I'm not using pins for the job. Cut apart on the drawn line and press. 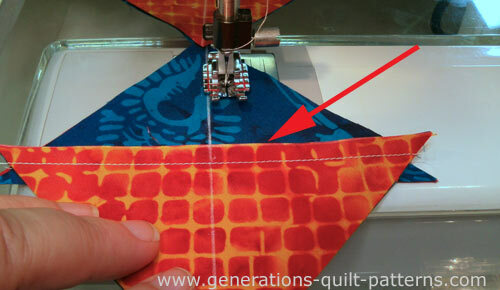 This time, twirl or spin the seam allowances to reduce bulk in the center of the quarter square triangle (below, right). Use the chart below to check the accuracy of your sewing. Trim your QST to size as needed. To trim our 7-1/2" finished Massachusetts block, place the intersection of the 1-1/2" horizontal and vertical line over the center of the QST to trim. The center of the unit is 1-1/2". For more detailed information on this 'sandwich' method of piecing quarter square triangles and for trimming instructions, click here. 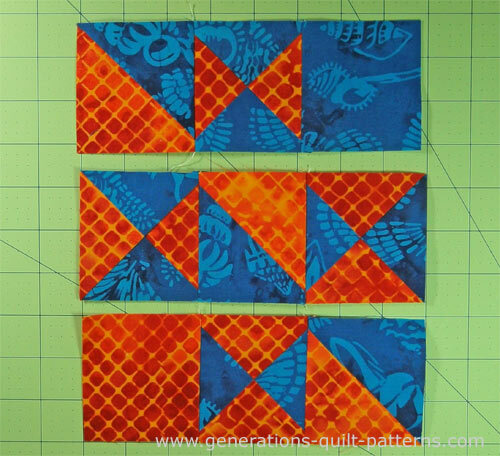 Lay out the HSTs, QSTs and cut squares into the Massachusetts design...remember each side is a mirror image of the other across the diagonal line. 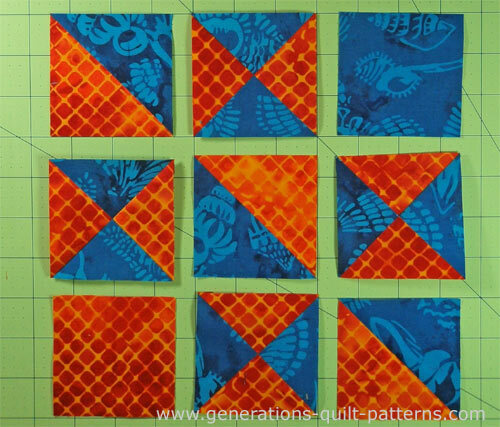 The left and bottom edges of the block are the light (orange fabric) edges of the sewn patches; the top and right are framed by the dark (blue fabric) sides of the patches. Stitch the patches into rows double checking that they are in the correct order. You may need to rotate a sewn patch 180 degrees in order to get the seam allowances to nest for easier matching. Press with seam allowances away from the QST-units. You may need to reposition a seam allowance or two on the quarter squares as I did. Rotate the patch first to see if that works. Then simply press the long seam in the opposite direction. Easy Peasy! This is your finished Massachusetts quilt block ready to be pieced into your quilt! There's plenty more to keep you busy! 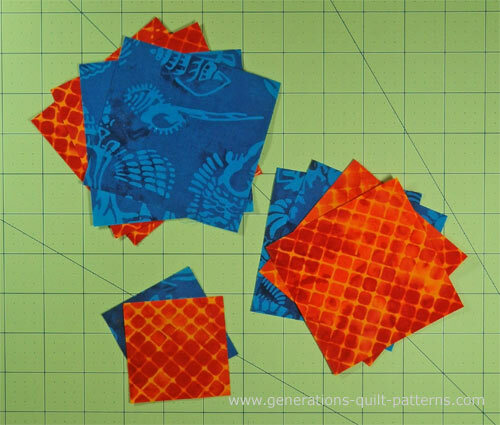 Just check out our Free Quilt Block Pattern Library to find blocks for your next quilting creation!